Intel debuts 8th Gen Core U-series (i7-8565U, i5-8265U, i3-8145U) and Y-series (i7-8500, i5-8200Y, m3-8100Y) processors. Intel today announced additions to the 8th Gen Intel Core processor family: The U-series (formerly code-named Whiskey Lake) and Y-series (formerly code-named Amber Lake) are optimized for connectivity in thin, light laptops and 2 in 1s for the first time, while also providing performance and long battery life. The 8th Gen Intel Core U-series processors bring integrated Gigabit Wi-Fi to thin and light mainstream laptops for the first time, delivering up to 12-times faster connectivity speeds. Users can now download their favorite shows and movies in under a minute, create, edit and share 4K/360 video content 6.5-times faster. 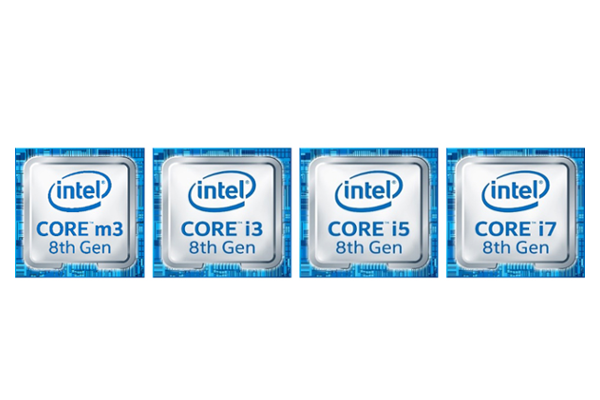 8th Gen Intel Core Y-series processors also deliver fast connectivity options, including fast Wi-Fi and LTE capabilities with unprecedented performance, to the some of the thinnest and lightest laptops and 2 in 1s in the market with extended battery life. The latest 8th Gen Intel Core i7, i5 and i3 (U-series) processors deliver the ultimate performance in a 15-watt envelope with up to four cores and eight threads for mainstream laptops and 2 in 1s. + For the first time on this class of processors, Intel is delivering blazing fast connectivity with integrated Gigabit Wi-Fi with Intel Wireless-AC for faster sharing, streaming and downloading. Paired with Intel LTE modem options, consumers will have fast connectivity wherever they are7. + Users can simplify their lives and get more done with Amazon Alexa and Microsoft Cortana to help control lighting and temperature in their homes, play music, create lists and shop with the sound of their voice, whether they are at home or on-the-go. + Devices with the new U-series processor can also support Dolby Vision HDR and Dolby Atmos immersive audio. Together, the fusion of Dolby Vision and Dolby Atmos transform PCs into entertainment powerhouses. The first 8th Gen Intel Core i7, i5 and m3 (Y-series) processors are balanced for mobility and deliver incredible performance that people expect from Intel processors in super thin and light devices with fast Wi-Fi and LTE connectivity. + Stream, share or download with Intel Wireless-AC supporting Gigabit wireless speeds, and experience seamless and reliable connectivity with Modern Standby and eSIM support with Intel's Gigabit LTE modems. + Improved touch and stylus interaction to power creativity and sketch, shade and paint with precision. + Ultra-sleek, thin-and-light designs less than 7 millimeters thick and lighter than 1 pound for use at home, in the office and on-the-go.